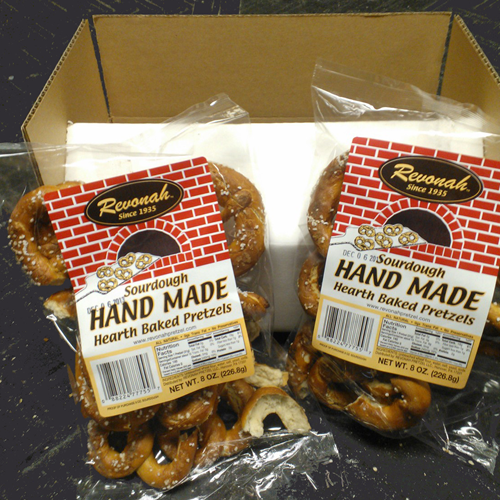 Revonah Pretzels - Hand Twisted Since 1935! Our fresh, hand made, hard pretzels create a tasty addition to any of your upcoming events! People tell us that once they have tasted a delicious Revonah hand twisted pretzel they're spoiled forever and can never eat any other pretzel but Revonah's. Now we can tell them that they will never have too! Revonah Pretzel will deliver their famous hand made pretzels right to your doorstep. You will never have to go with out your favorite pretzel again. Revonah pretzels are a masterpiece of the baker’s art. We make our pretzels from our original sourdough recipe. We roll and twist every pretzel by hand and salt them to perfection. Then we bake them in our 70-year-old hearth brick and stone oven and slowly dry them in a heated kiln, which creates the perfect crunch. Our diverse selection of tasty flavors will satisfy your taste buds. 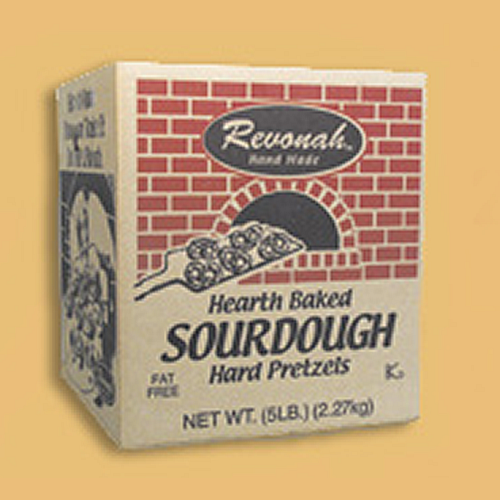 Revonah pretzels are made fresh by hand every day. Please call us at (717) 630-2883 or e-mail us at revonahpretzel@yahoo.com for more information on how to have our soft pretzels hand delivered to your special event in the Greater Hanover area. You can also order our hard pretzels online to be delivered right to your door. Revonah Pretzels featured on CBS’s "The American Baking Competition"
Pretzel–Town, USA is none other than the quaint town of "Hanover, Pennsylvania." Did you know that Revonah is Hanover spelled backwards? We are truly part of Hanover's pretzel history. Don’t miss out on our mouth-watering, sourdough treats! Stop by our lovely bakery outlet or order online today.